...let’s say you have a gateway in your house: if a vial of medicine were to enter your coverage zone, it would send its location and temperature data to your gateway, which would then send it to its proper destination in return for a previously agreed upon cryptocurrency fee. These steps would then be cryptographically verified and recorded in the distributed ledger. In terms of IoT network competition, LoraWan and SigFox IoT networks are already popular and established in several places in the world, but wireless coverage isn't great because these networks rely on companies to build gateway infrastructure. Helium crowd sources this infrastructure instead, which could result in greater coverage. Most cryptocurrencies base the security of their network on the 'proof of work' process, which is a way to ensure that the miners get rewarded for the heavy cryptographic computations that they do in order to secure the network. Instead of proof of work, Heliums idea is to use a 'proof of coverage' system, where other gateways will confirm if a gateway is providing coverage and is in the correct location. 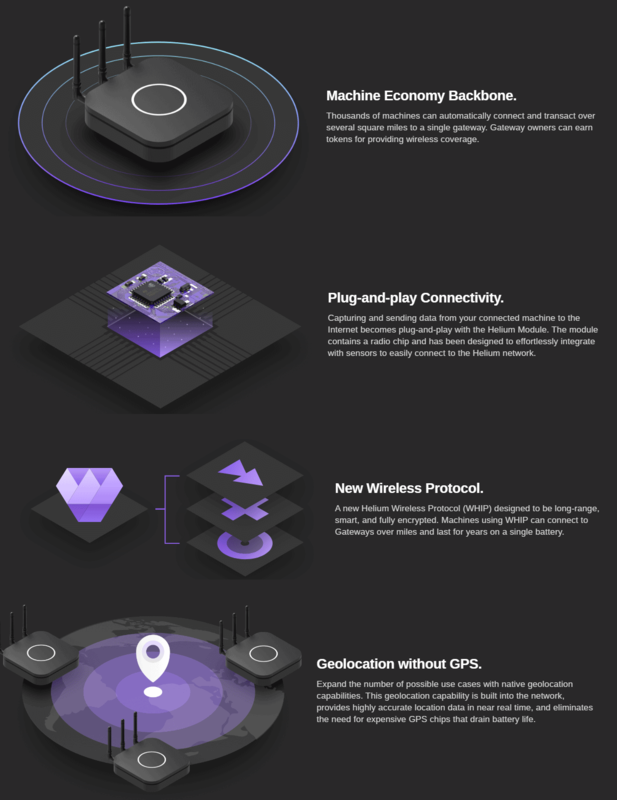 Helium cryptocurrency 'miners' will be the people running the internet connected gateways, and they will be paid for any devices that use their wireless coverage. According to one of their latest blog posts, the wireless gateway radio system is to be based on a software defined radio architecture. The reasoning behind using SDR is that they need to support potentially thousands of wireless sensor channels, require the sensors to be able to be geolocated, and require the radio to be low cost and energy efficient. For geolocation of sensors they are considering the use of radio direction finding techniques that we assume will be based on pseudo-doppler, or alternatively they will use the time difference of arrival (TDoA) technique which requires the signal to be received by multiple gateways. The SDR will be developed on a dual core TI SoC, with four programmable realtime units (PRU), which they'll use to interface with the RF chips. At the moment Helium is just a whitepaper, and we haven't seen any concrete evidence of a working SDR design yet, but according to their website they plan to launch gateway hardware in Q4 2018 for a cost of $495.